Christian Aid’s vision is of a world free from poverty, and we believe that vision can be a reality if we work together. By contributing their time and skills, our volunteers are helping to improve the lives of some of the world’s poorest people while also developing personally. 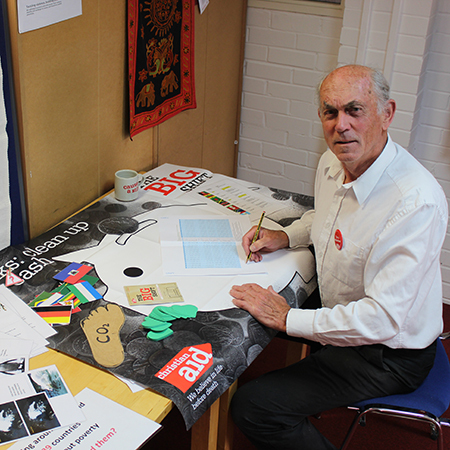 Hear one of our current volunteers talk about why they chose to give time to Christian Aid. Take up a role in one of our offices to use and develop your skills while making a difference. Find our latest opportunities on our jobs and volunteering website. Once you have found a role that interests you, please complete the online application form and we will get in touch. Depending on the role, you may be invited to attend an informal interview and asked to give us the names of two referees. Where volunteering involves contact with children or young people, your application will be subject to an Access NI check or the Garda vetting. For more information email our volunteering team or get in touch with your local office. Christian Aid values diversity and welcomes applications from people from all sections of the community. We do our best to treat everyone equally. We don’t send volunteers to work overseas. We involve volunteers from the countries that we work in. If you are interested in volunteering overseas you may find the World Service Enquiry website helpful. We welcome volunteers from outside the UK but, unfortunately, we can’t help with travel arrangements, visas or accommodation. If you are a UK resident but are from outside the European Union, we recommend that you check the terms of your visa with the Border Agency.